Past week followed script, but Friday was a bit stronger than expected. 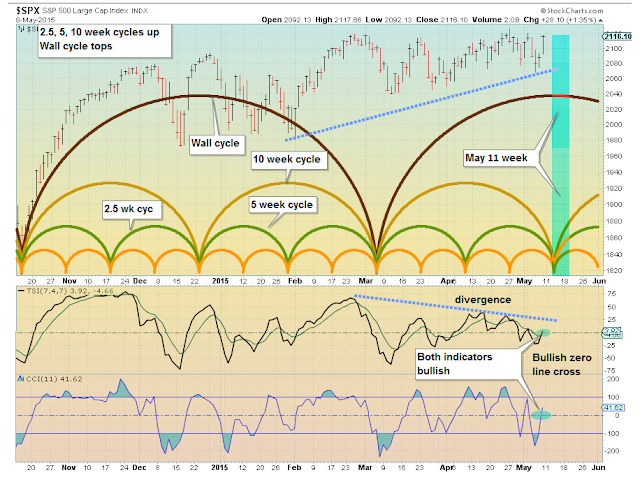 In the coming week the 3 shorter cycles are up. The longer Wall cycle (20 weeks) tops. So the bias should be up and with 3 cycles up it will be no surprise if some new ATHs (All Time Highs) are set (DJIA, SP500, NAZ) with a strong upside bias. Also, TSI and CCI gave positive indications. Fri close - SP500 set a closing high Thur. and again on Fri (intra day higher than close ATHs). DJIA set intra day highs Thur. NAZ close but no new highs. I did say do not be surprised if we see new highs this week. Up move was later in the week than I expected.